It’s been almost three years since I had a planned admission to hospital, and a little over a year that I’ve had without an admission at all. So, planning and packing my hospital bag was a quite daunting task. What would I need? How much would I be able to take with me? How was I going to keep myself occupied when I didn’t have visitors? Did I have enough of everything? The first thing I did was order my repeat prescriptions. My scripts become available at different levels of ‘low stock’ so I tried my best to get the majority of my medication ordered at the same time to avoid multiple trips to my GP and the pharmacy. Luckily, I’ve been really good with my stoma supplies, so I only needed a couple of things and they have arrived. In terms of space, stoma supplies take up a big chunk of space. So to save time and confusion, I got creative and made individual packs of what I use for each change. 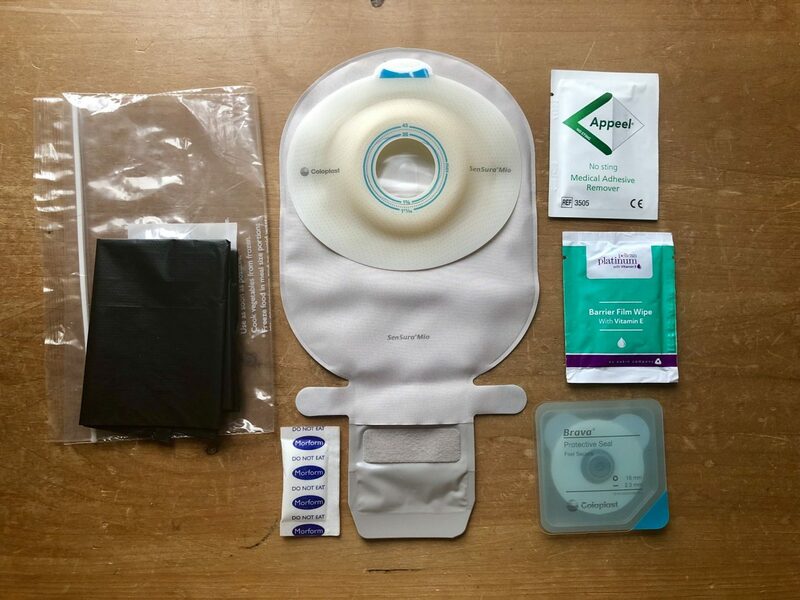 ABOVE: a small ziplock, disposal bag, my current stoma bag – not pre cut but marked up for cutting – a remover wipe, barrier wipe and seal. And just in case, a Morform sachet which will solidify any liquid output until I can get to empty my pouch. 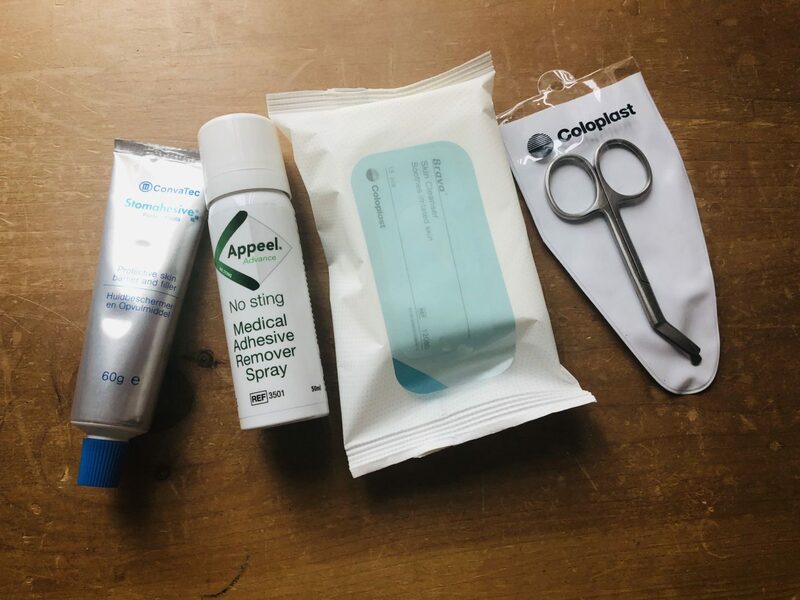 BELOW: stoma paste, remover spray, skin cleanser and my ostomy scissors. I have packets of dry wipes too. 4-6 pairs of socks with grippers on the bottom. Flip flops or slippers for leaving the room. Dry shampoo: washing your hair will be very difficult in hospital – think IV’s, dressings and wounds OUCH – so this is a must for me. Phone charger: I would recommend either purchasing an extra long cable on Amazon: sockets are usually behind the bed which makes a short cable near impossible to use. 2-3 comfortable lounge wear: think PJ bottoms, nighties, leggings, sweatpants – loose fitting is always best. 1-2 zip up top, sweatshirt or fleece jacket in case it’s chilly. 3-5 tank tops or loose fitting T-shirts : this will give room for vitals to be taken and your IV’s to be accessible. Face wipes: I go for Nivea always because it’s great for your skin, which will dry in hospital. Hairbrush and some hair grips: while bedhead will be unreal in hospital, sometimes you just need it off your face. Soft blanket – hospital ones are quite heavy and not very comforting. Dressing gown if that’s your thing. Laundry bag / bag to keep dirty clothes separate from clean ones: I usually have some plastic ones in my bag anyway. Snacks – this obviously depends on your current intake or what’s available in hospital. What I will do ahead of my admission is bathe, shave and wash my hair. Two very basic and essential things that make me feel clean as well as prepared for the volume of people who will see my body whist under. On Wednesday I will be preparing my pre-admission tasks and ensuring I have followed all instructions – failure to do so can result in my operation being cancelled – all while remaining calm and strong. This operation is major surgery and will change my life once again. Getting in the right frame of mind is sometimes tough, it’s difficult. My stoma was a choice made by myself almost three years ago but it was an emergency and not planned with this much time. This time around, I have advocated and requested this operation to be performed. Having that amount of control over my present – as well as my future – is overwhelming. If anyone tells you surgery is an easy option, it is not.